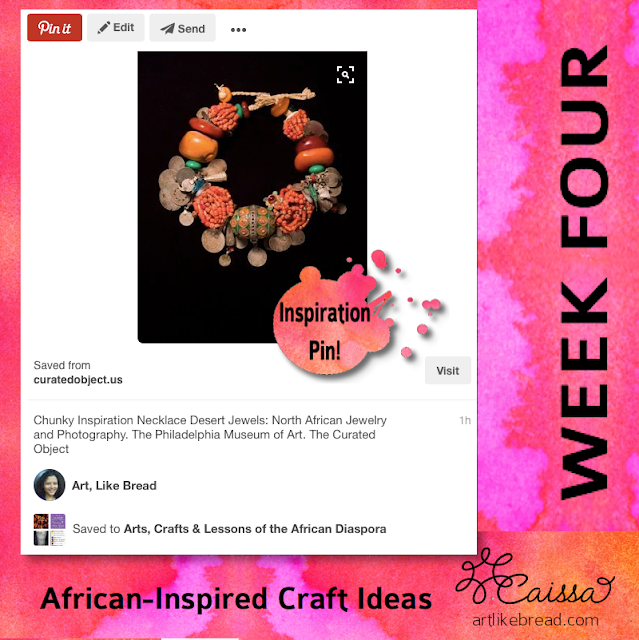 Today's post is kind of exciting because it's about a topic that is dear to my heart, but I haven't seen a lot of this out in the crafting world. In preparation for African American History Month, I am sharing a Pinterest board and crafting ideas for each week of the month! Click on the widget to follow my board! I'll be growing it over time with great art inspirations, craft ideas, and substantive lesson plans/information. 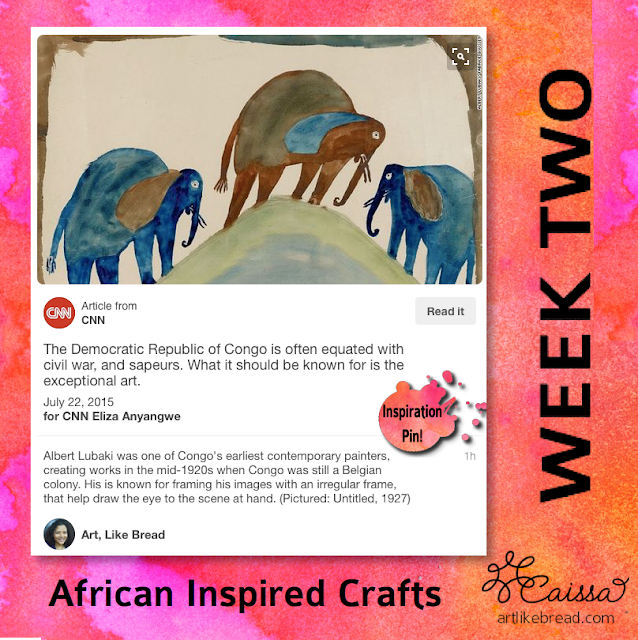 Follow Art, Like Bread's board Arts, Crafts & Lessons of the African Diaspora on Pinterest. 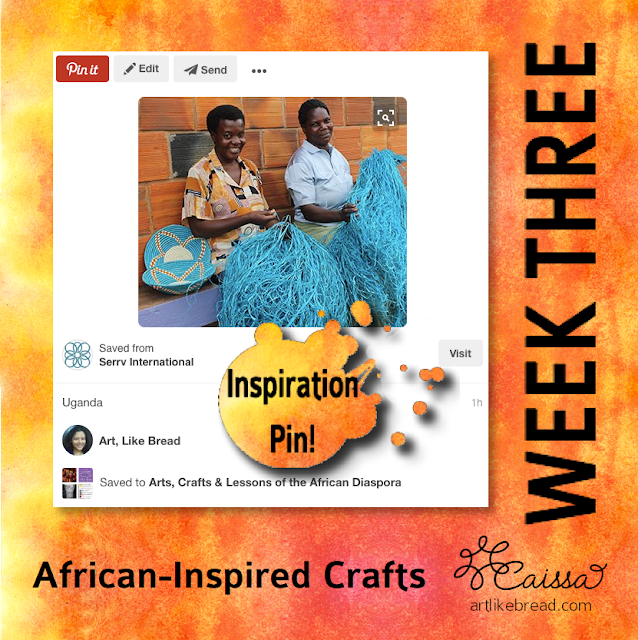 For each week of the month, I'll be taking a pin and crafting a project inspired by it. I'll share my process & project with you each week. 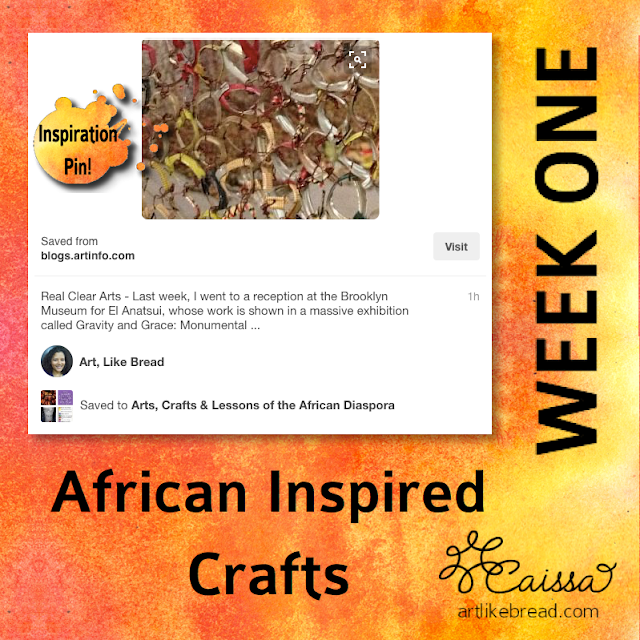 During the first week, we'll take inspiration from El Anatsui, who joins bottle caps with wire to create massive metal textiles. We'll do a very scaled-down version! I love these elephants and there is also an elephant wall etching on my Pinterest board. During week two we'll draw elephants. These Ugandan women are making baskets from brightly-colored fiber. I'll crochet a basket inspired by their beautiful work. This is the necklace that inspired it all! I adore this chunky necklace which was part of an exhibit on North African jewelry. We'll make our own version using chunky beads and charms. If you would be interested in step by step tutorials on any of these topics, please let me know by leaving a comment or contacting me at artlikebread (at) gmail (dot) com. As always, thanks for reading the blog! Please leave your thoughts, ideas and questions in the comment section below. If you liked this post, please share this post with a friend through social media and go out of your way to learn something new about the African diaspora! Like my Facebook page for updates and more crafty sharing!